A head teacher arrested as part of a cash for honours probe has been freed on bail "to return... pending further inquiries", Scotland Yard has said. Des Smith, 60, had been held for questioning under the 1925 Honours (Prevention of Abuses) Act. In January, he had suggested sponsors for the government's flagship city academies programme would be given honours in exchange for funding. Mr Smith later quit his post with the Specialist Schools and Academies Trust. The trust helps the government recruit education sponsors. Set up in September 2005, its president is Lord Levy, Tony Blair's chief political fundraiser and close friend. Mr Smith quit his post on the SATT council in January after admitting he had been "naive" when talking to a reporter posing as a potential donor's PR assistant. He reportedly told the Sunday Times that "the prime minister's office would recommend someone like [the donor] for an OBE, a CBE or a knighthood". After his resignation he told the Guardian he had "been shattered by the experience. I was naive, I shouldn't have said what I did. I'm desperately sorry". Downing Street said at the time it was "nonsense to suggest that honours are awarded for giving money to an academy". Mr Smith remains headmaster of the All Saints Catholic School and Technology College, Barking and Dagenham. Local Labour MP Jon Cruddas told the BBC Mr Smith had greatly improved results at the school and should be judged on his "21 years as a significant local public servant". "He is a fantastic head teacher," he added. In a separate development, elections watchdog the Electoral Commission publishes a new draft code of conduct on reporting loans in the wake of discussions with the main political parties. It says the parties agree to report any loan more than £5,000 - or more than £1,000 if the donor has given another amount that needed to be reported in that year. The draft code says "this would apply whether or not the party regards the loan as having been made on commercial terms". The cash-for-honours inquiry was originally launched in response to a complaint by Scottish and Welsh nationalist MPs that Labour had broken the law preventing the sale of honours such as peerages and knighthoods. It has since been widened to cover the activities of other parties. The investigation is being led by Deputy Assistant Commissioner John Yates, who has said he is prepared to widen the investigation to consider more general allegations of corruption. 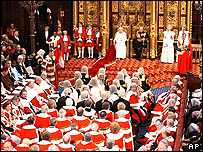 It followed reports that the House of Lords Appointments Commission had blocked the appointment of four of Prime Minister Tony Blair's nominations for peerages - all wealthy businessmen who had made loans to Labour. None was on the list of new working life peers when it was published on Monday. One Tory nominee - who had loaned the party £2m - also missed out on a seat in the upper house. Mr Yates has already told MPs that he is prepared to widen the investigation to consider more general allegations of corruption. The Specialist Schools and Academies Trust describes itself as the "leading national body for secondary education in England, part funded by the DfES (Education Department), delivering the government's Specialist Schools and Academies programme. Anyone found guilty under the 1925 Honours (Prevention of Abuses) Act - designed to deal with those who both give and accept honours under inducement - could face imprisonment for up to two years or fined an unlimited amount. The Act was introduced after the scandal of the early 1920s when David Lloyd George was offering peerages and lesser honours at a price.